Anyone who loves playing slot games on their smart phone can read this and discover some of the better ways to play mobile slots to win prizes. One thing is pretty certain and that is if you play, it's quite natural to want to win and the best way to make that happen is to know all the tricks. 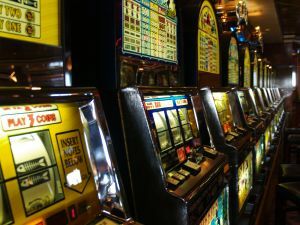 While at the end of the day slots are technically pure games of chance, many games have additional features that you need to know about to maximize your chances of taking the biggest jackpots available for each spin of the reels. This article takes a look at some of these tricks and why they can mean the difference between walking away from your game with a nice win in the bag or an empty wallet! How Much of a Slots Game is Pure Chance? When the first slot pay fruit machines appeared in bars, clubs and even many common stores, they were simple games that had no embellishments. You simply put your coin in the slot, pulled the handle and the three reels would spin and then stop to display three symbols on the "win line". If three winning symbols lined up, you won the amount stated on the win card. There was absolutely no skill involved and there was no way to influence the winning chance or payout level, making the game one of pure chance. The only real winner was the machine owner because the payout level could be manually set to whatever payout percentage they decided upon. That meant it was possible for shady owners to set the payout percentage quite low and improve their takings at the end of each day. But that's a story for another article. This one looks at modern games and how they have evolved to provide many embellishments that can affect the way the machine pays out and the amounts the player can win on a certain spin. There are several ways in which you can now influence the end result of a game on a spin by spin basis. Let's look at some of the more common ways in which you can do this. One of the earliest embellishments to the simple reel slot machines was to introduce the "nudge" feature that allowed the player to nudge reels along one symbol at a time after the reels had stopped spinning in an attempt to bring down a winning symbol to match one or two that were already on the win line. This feature has evolved to video slots and also to mobile slot games and it means that players can create a winning line where there wasn't one before. Knowing how to use this feature is vital because failing to bring down winning symbols will almost certainly mean you miss out on a potential payout! Each game has its own idiosyncratic nudging feature, so it makes sense to learn how it works on games you like to play using "fun money" until you are confident to go for it with real cash. While there is not so much you can do to influence the outcome of the actual spin on each game, you can improve your chances of landing a winning line when the game provides for multiple win lines. These lines can run horizontally or diagonally (and some can line up in multiple ways) so it helps to know what these are when learning a game. It is extra helpful to know when multiple win lines are available along with a nudge facility. This way you will know which reels to nudge to line up a winning row of symbols! Many more mobile games incorporate bonus rounds that are triggered by certain sequences of wins or certain symbols lining up once the reels have stopped spinning. The more simple bonus rounds allow you to gamble your winnings with doublers or multiples so that for instance a £10 win can be doubled to £20 or even multiplied say 5x to £50 (depending on the game's feature, of course). Of course the operative word here is "gamble" and that means you could also lose your win. But when this feature is activated, it is always worth gambling. This is because, when you think about it, you're gambling anyway, so you might as well aim for the biggest prize you can get! Even more sophisticated games come with amazing bonus rounds that can be a lot of fun to play. They can be full blown video games where you have to get through a room and find all the hidden objects or steer your way along a road avoiding obstacles to pass the win line and collect the bonus win. Again, each game will be different and have a great in-game bonus to play. This has seen the humble one-arm bandit evolve from a simple handle pull game to a super sophisticated video game in its own right, with payouts reflected in the level of sophistication. The bottom line is that you really need to spend time studying and playing a particular game first with fun money in order to learn how each feature works and what you need to do in order to win the maximum payout for each completed feature. Our best advice is that you should only venture to play a really sophisticated game with real money on one of the mobile fruit machine sites of your choice once you have mastered the features to avoid leaving money on the table. After all, you're playing these games to win and enjoy the games while you're about it. The best way to enjoy a game is to know it inside out so you know what's coming and how to deal with it effectively to grab the best win you possibly can when the opportunity presents itself.